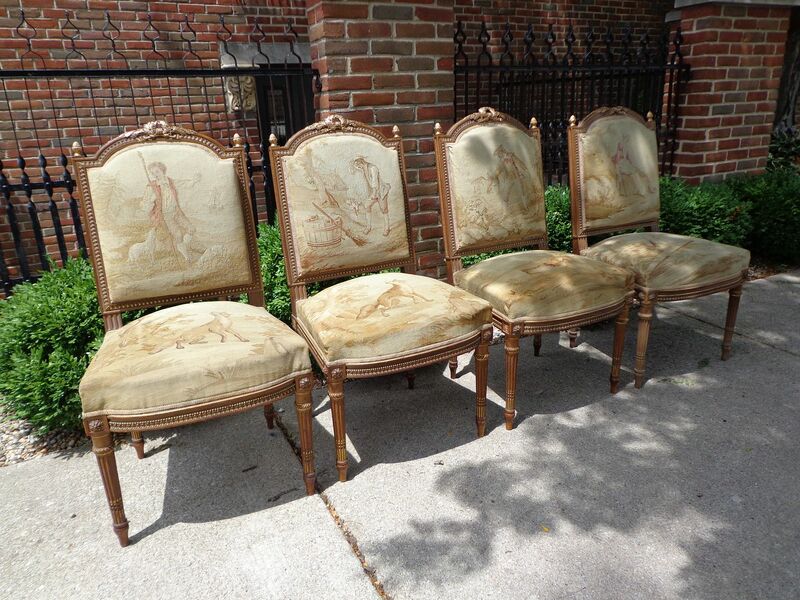 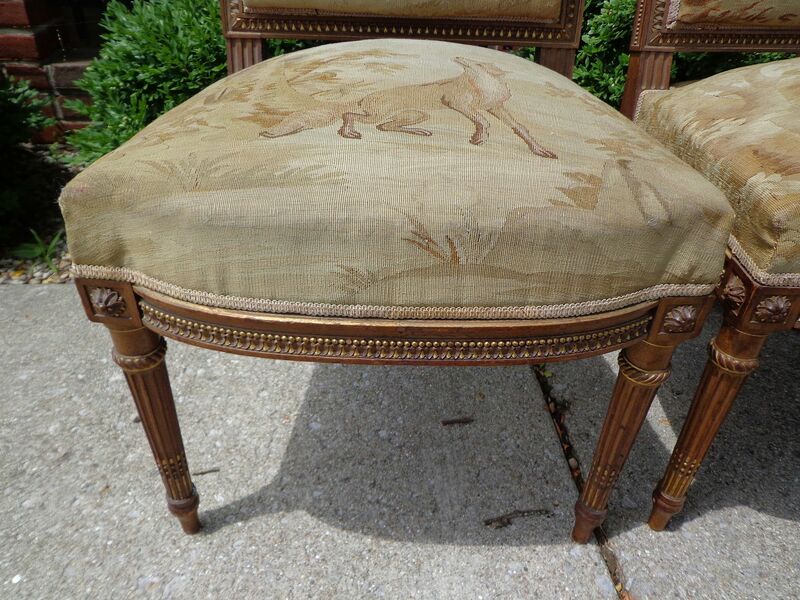 Just in we have a handsome antique set of four antique French Aubusson chairs. 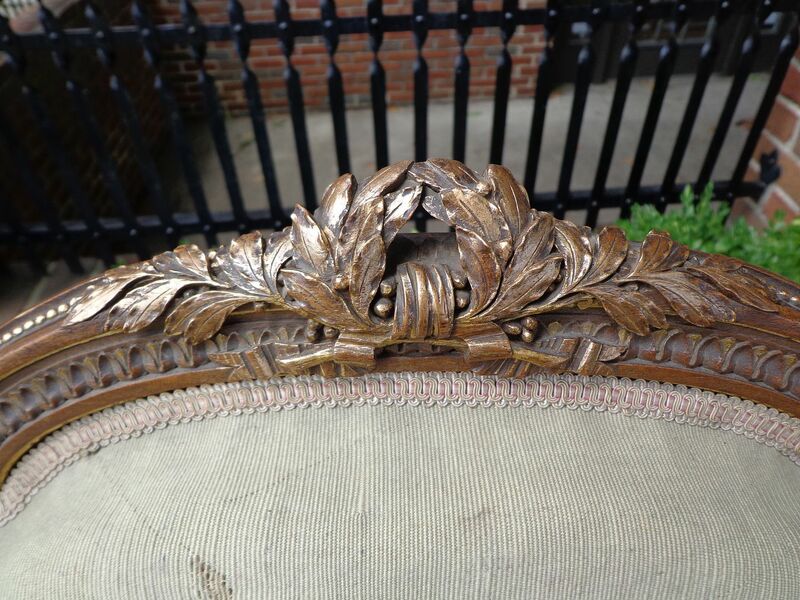 The chairs are beautifully hand carved with gold gilt detailing. 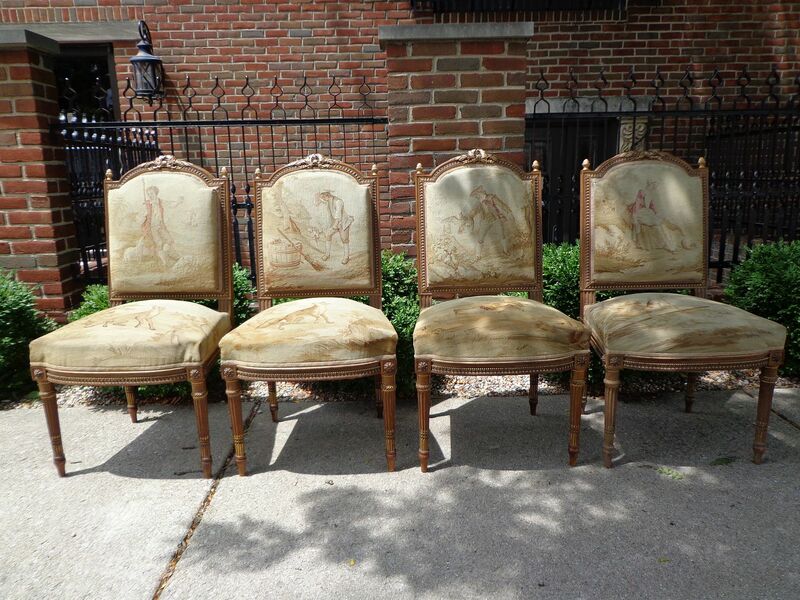 The chairs are upholstered in Aubusson tapestry. 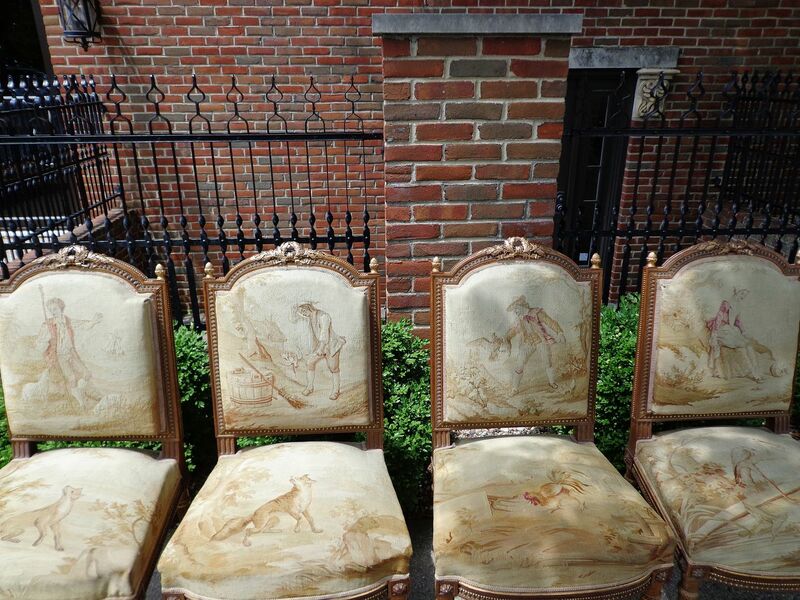 The four chairs all depict different rural scenes. 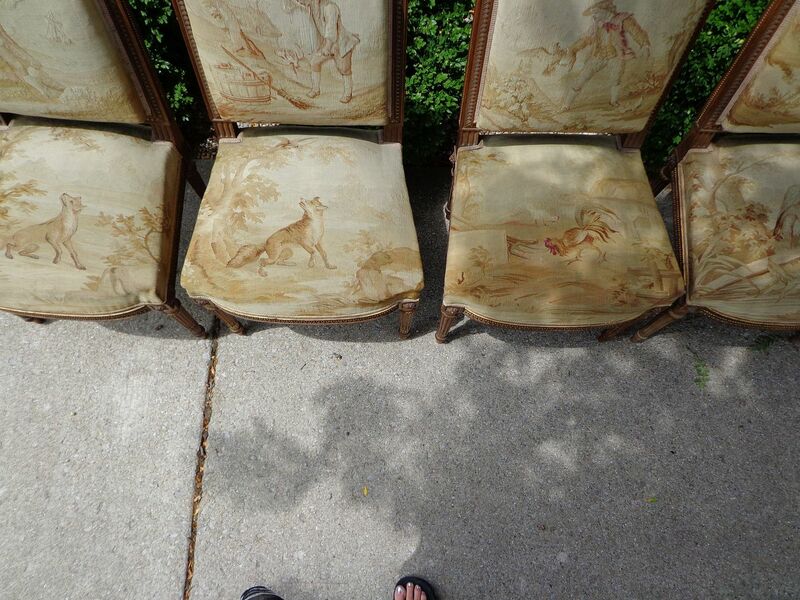 The backs of the chairs are all figural while the seats are animals. 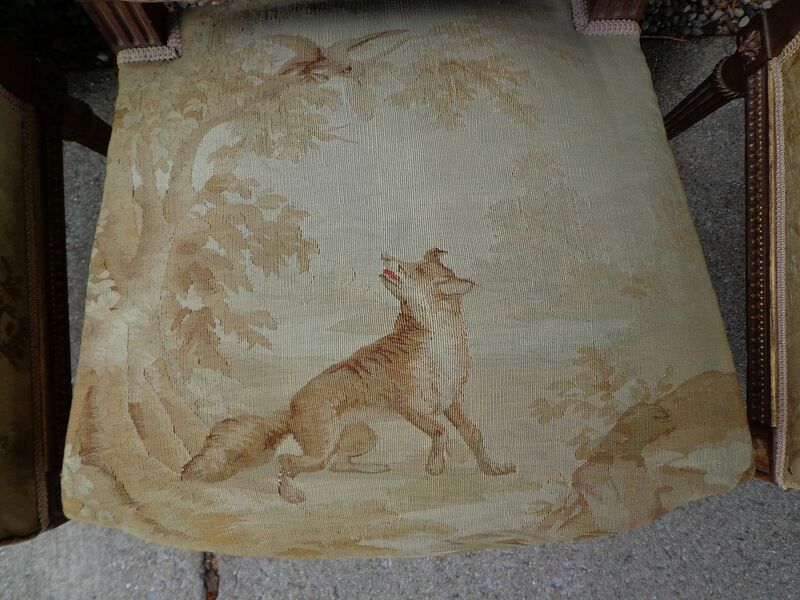 There are two different foxes , one rooster, and one heron. 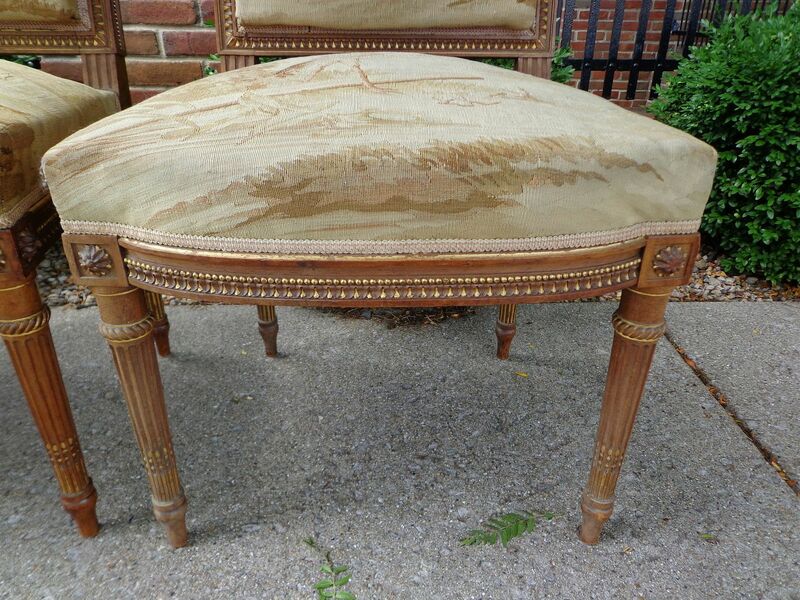 The chairs are sturdy and measure 38" tall at the back 22" wide and 18" deep. 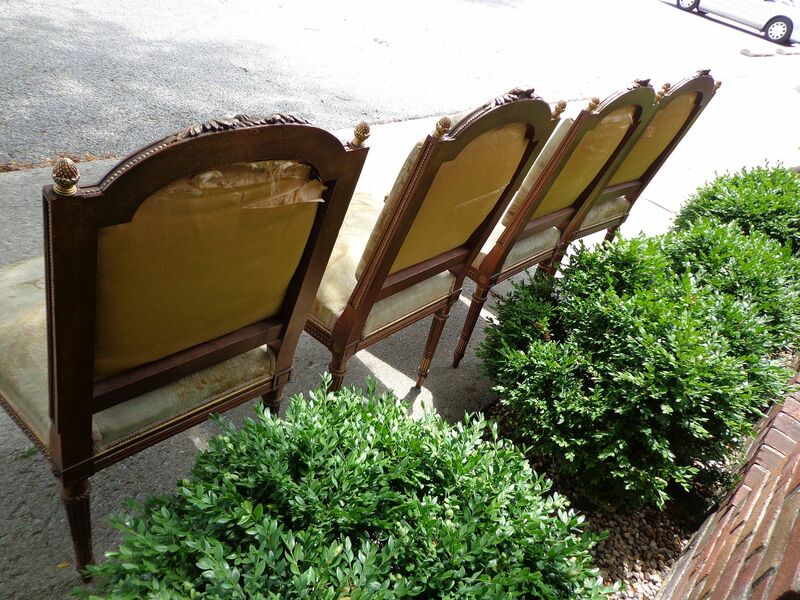 The chairs frames are hand carved wood what we believe to be walnut. We date the chairs circa 1870-1900 possibly earlier but we feel secure with that dateline. 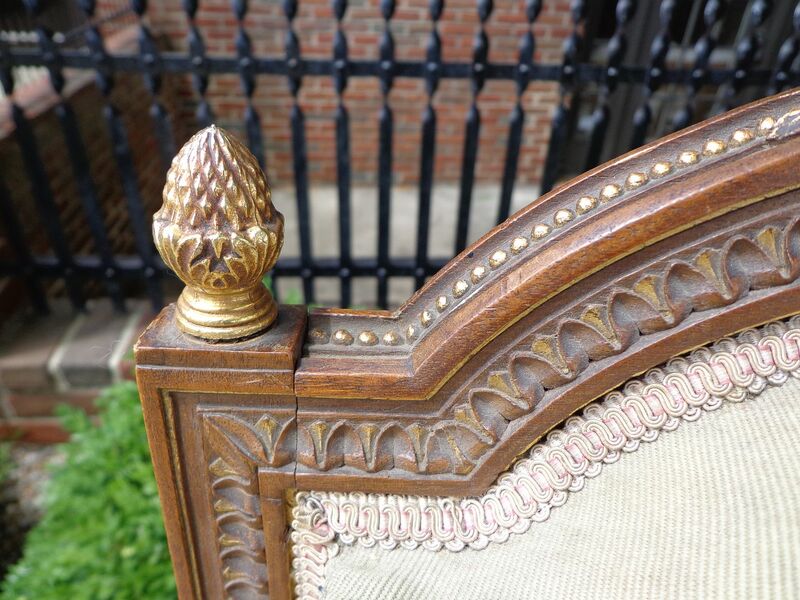 The finials are bronze gold gilt ormolu. 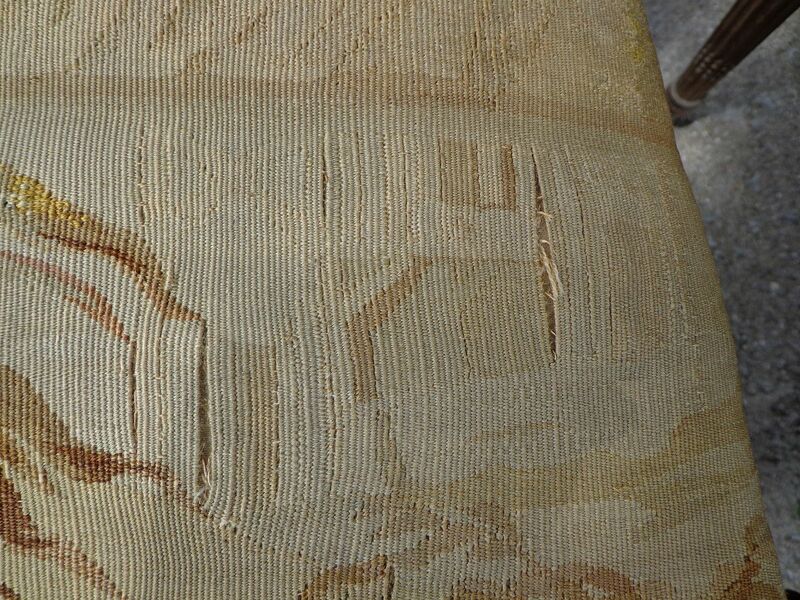 The frames of the chairs are sound in structure with some minor loss of detail. 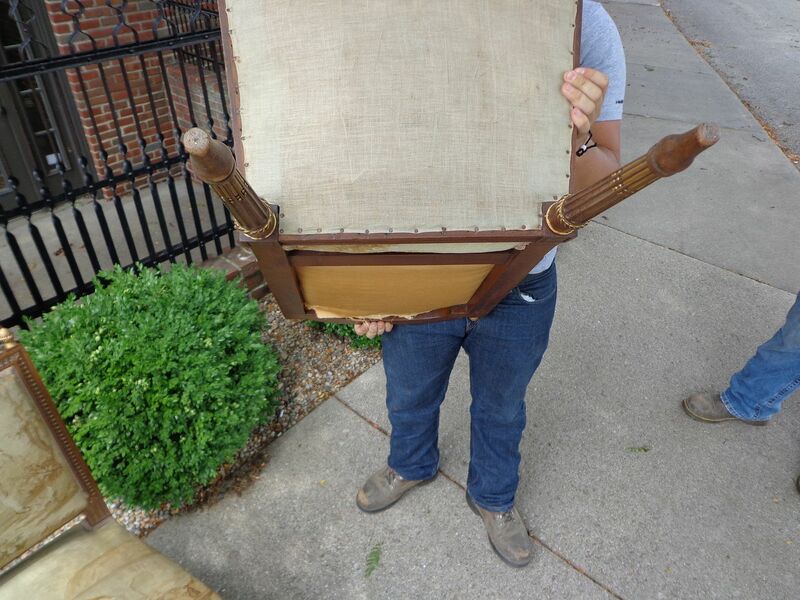 The chairs sit well. 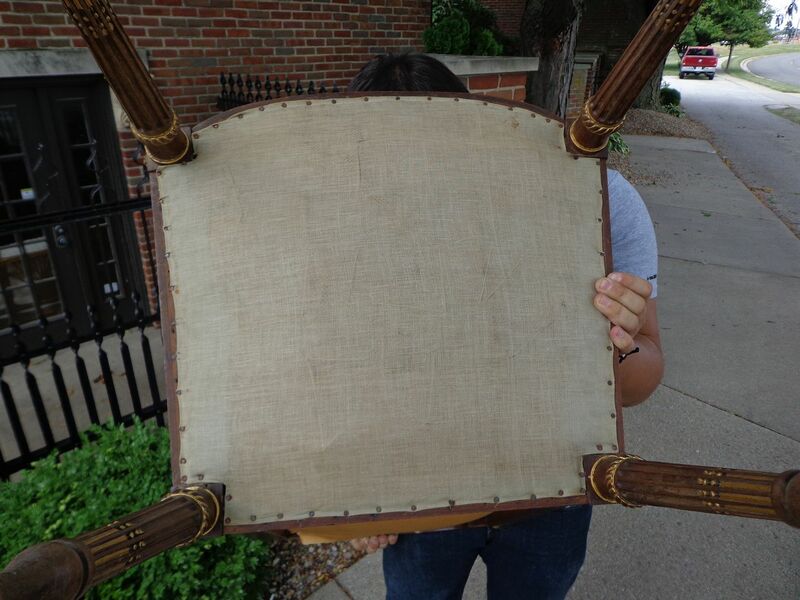 The under structure appears to be spring loaded tied frames and horsehair stuffed. 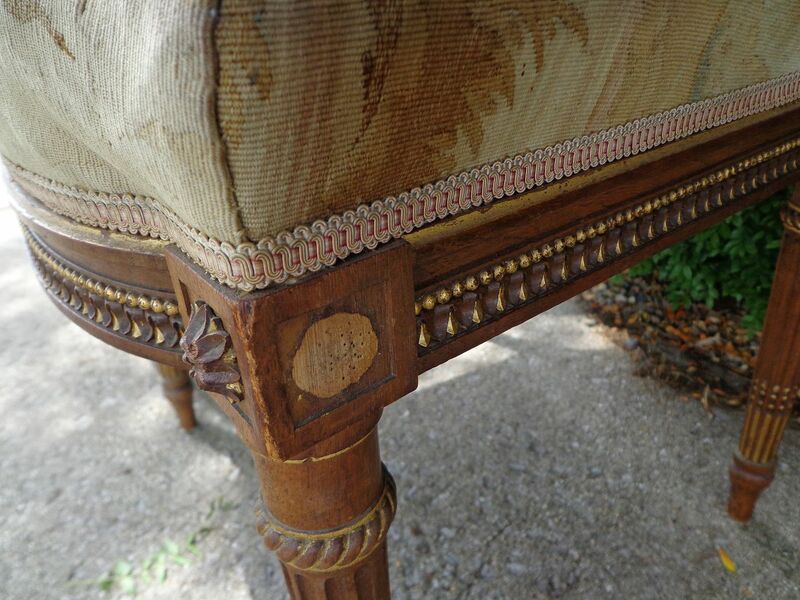 There are four small wood florets absent on the chair side legs and loss of part of the center wreath top back on one chair. 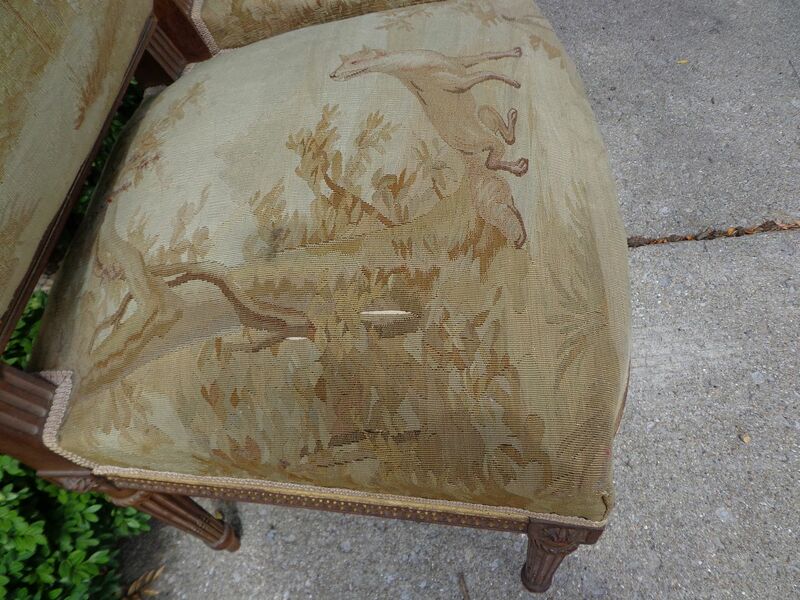 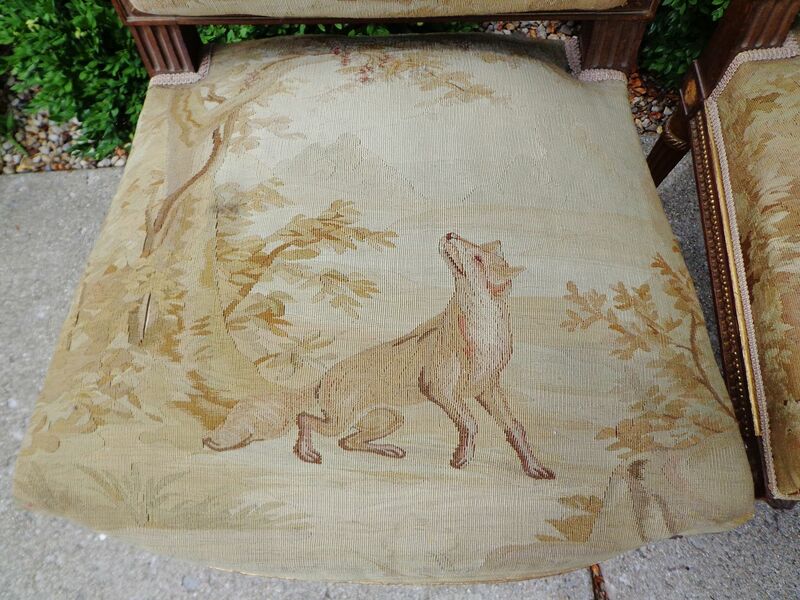 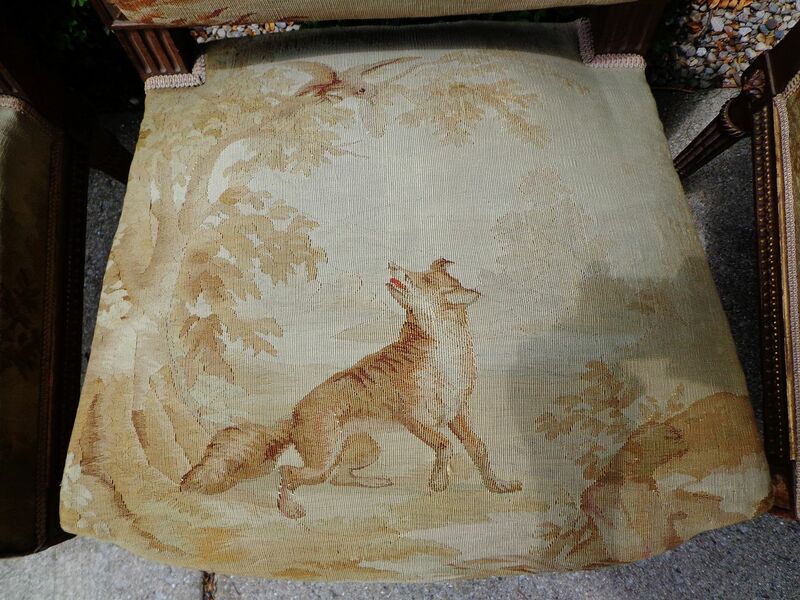 The Aubusson chairs are in need of some minor restoration of the tapestry. 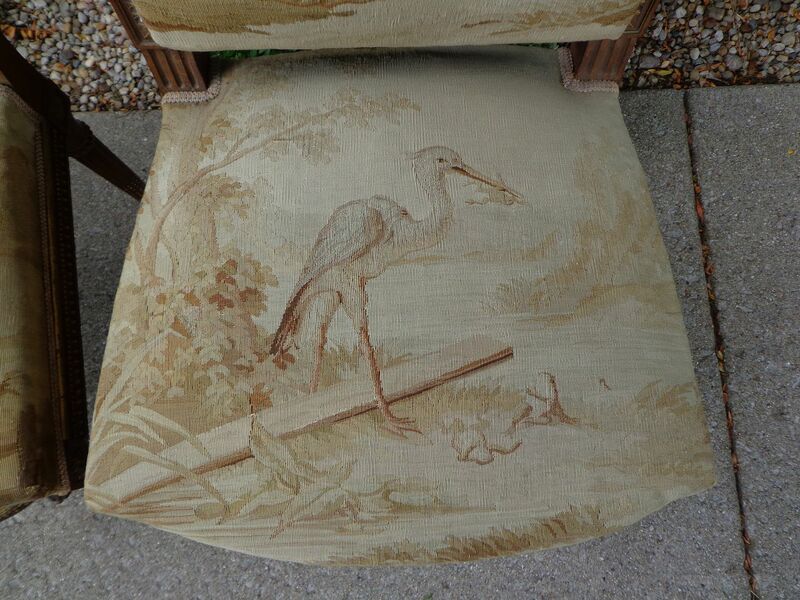 The rooster chair seat requires the most attention. 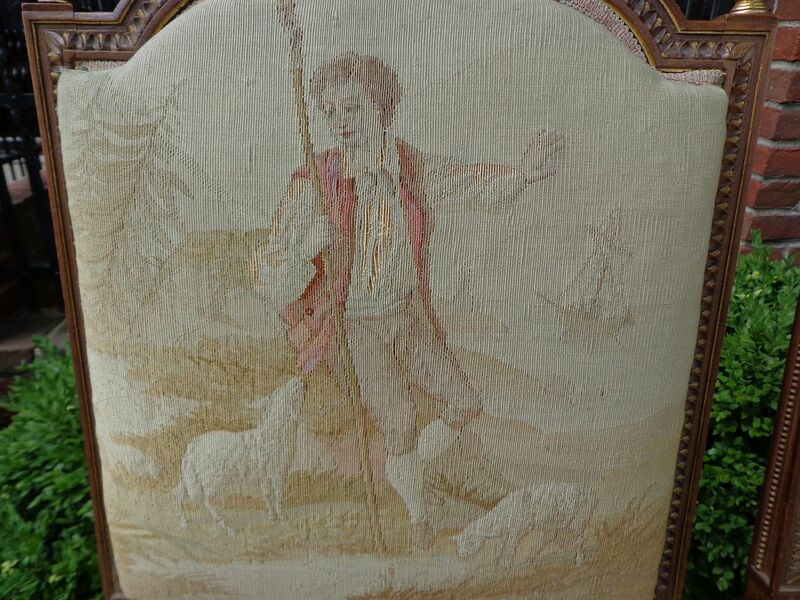 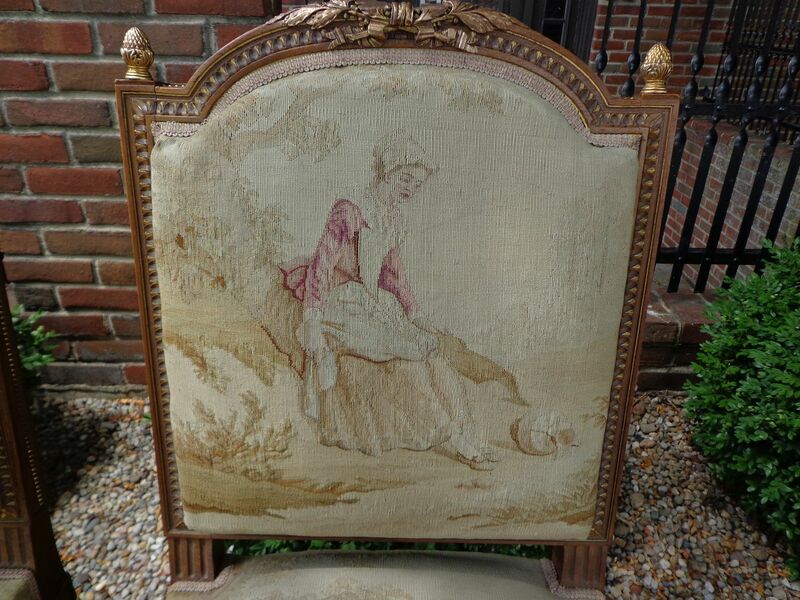 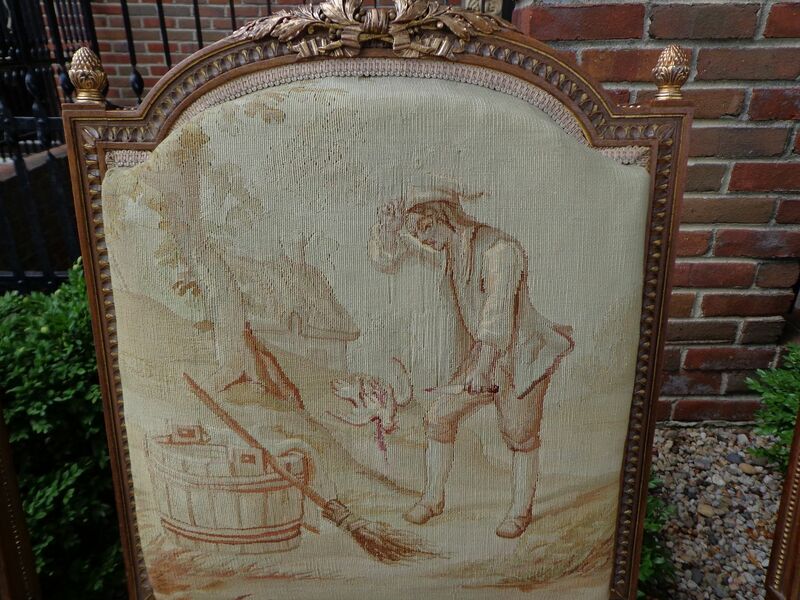 The tapestry backs are all in good condition with the exception of the shepard with the lamp. 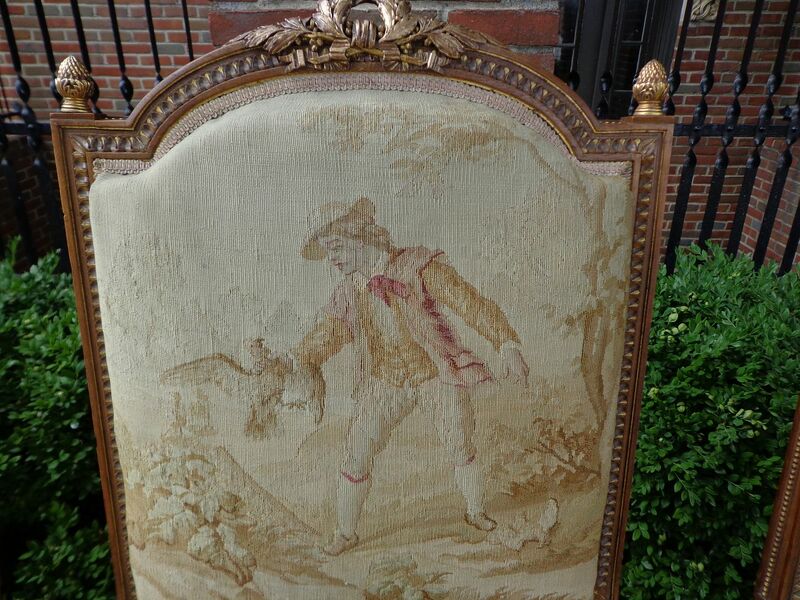 He has some splits that need mending. 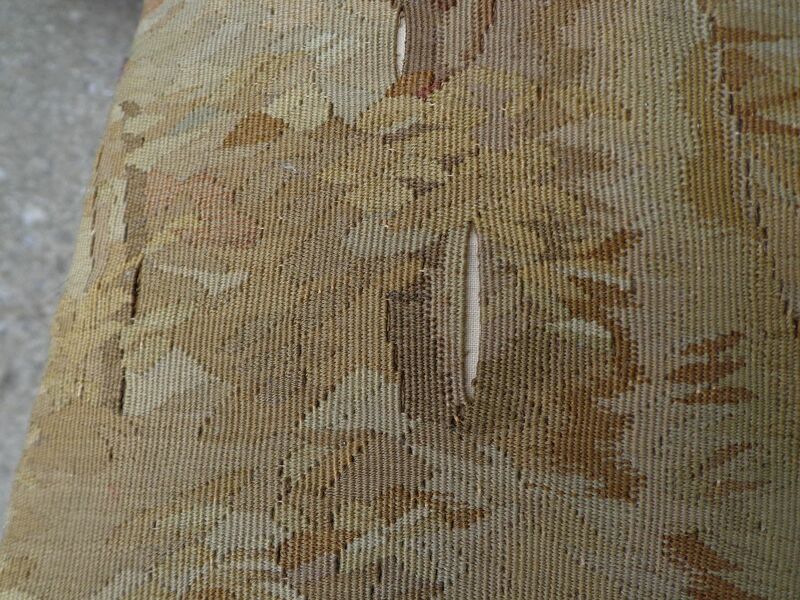 A few minor splits but no loss or fraying. 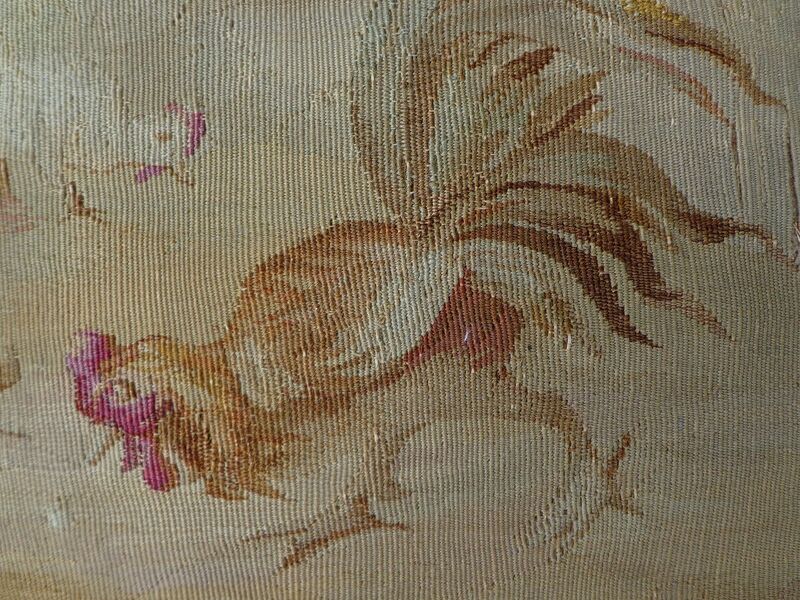 A clever seamstress with a fine needle could rejoin. 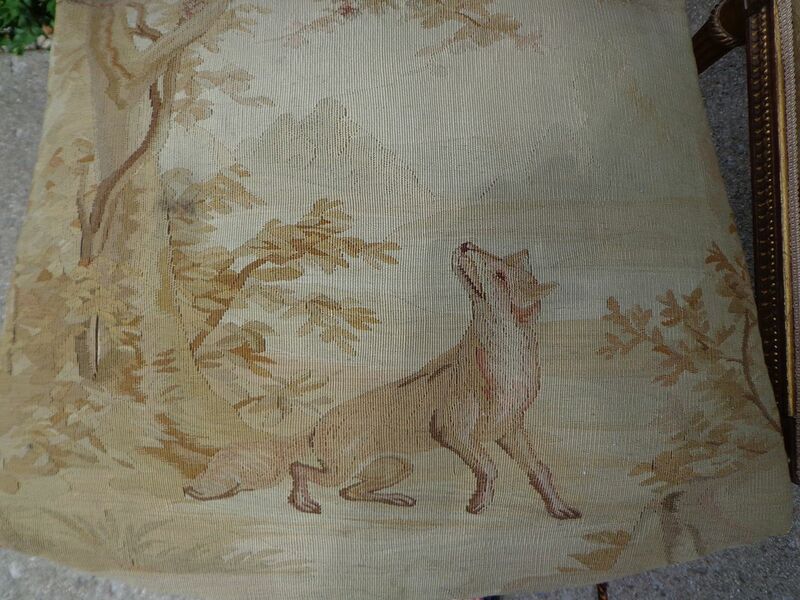 There is one repair to the tapestry which likely was a professional job as it is that good. 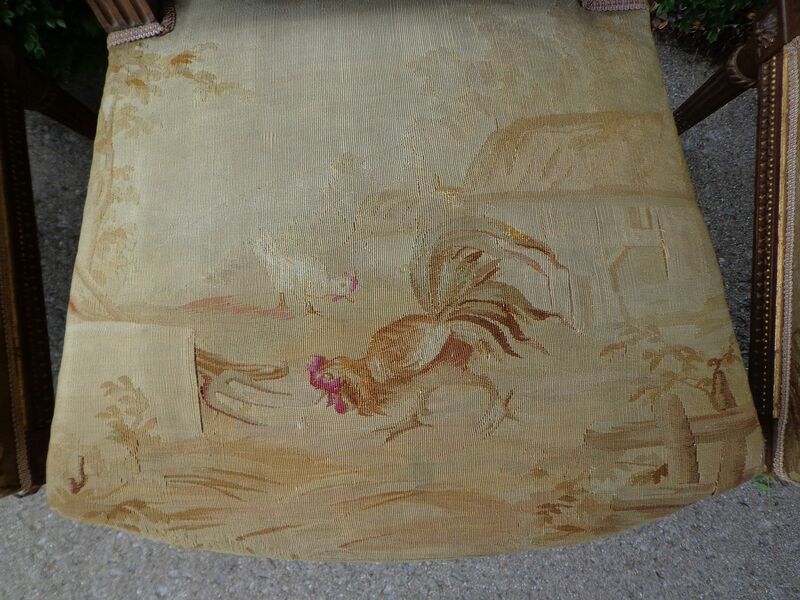 To inspect see rooster seat lower left quadrant. 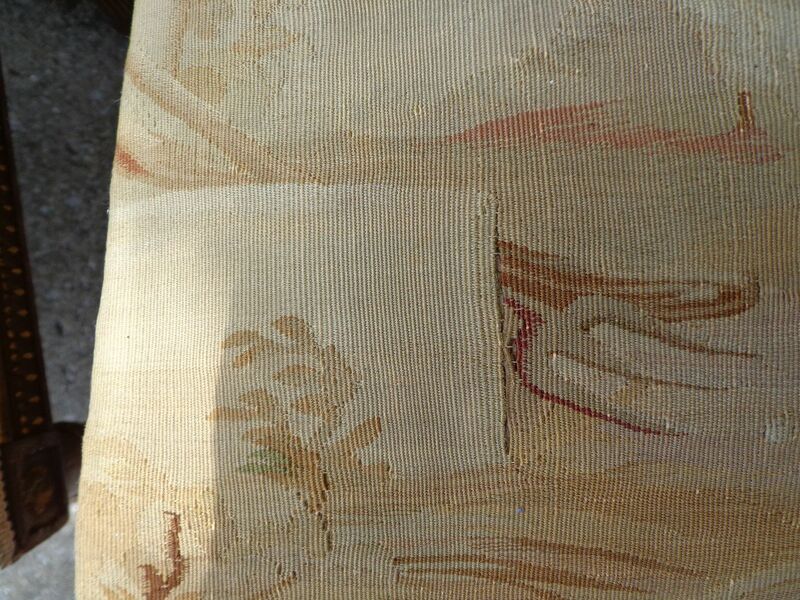 The chair backs are silk which need to be redone as there is damage on several and a better choice of fabric should be made. 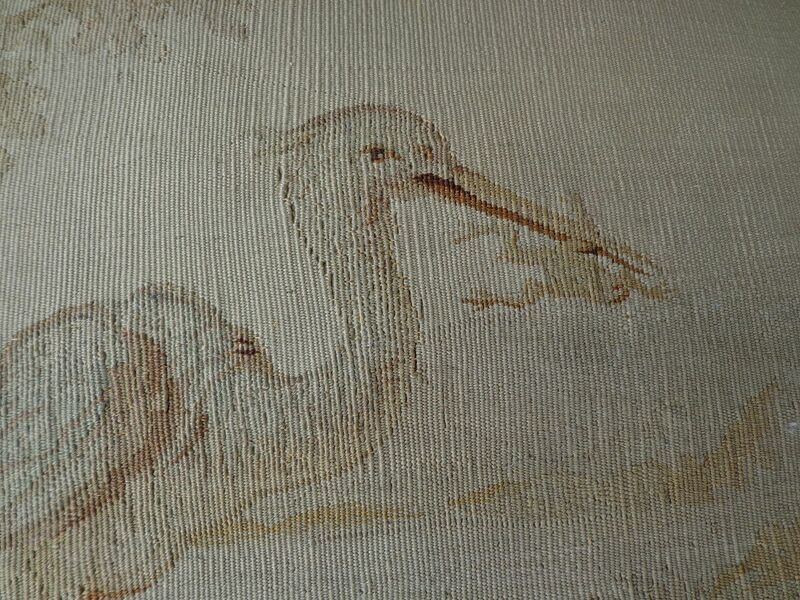 Please refer to photos as I have included lots of close ups. 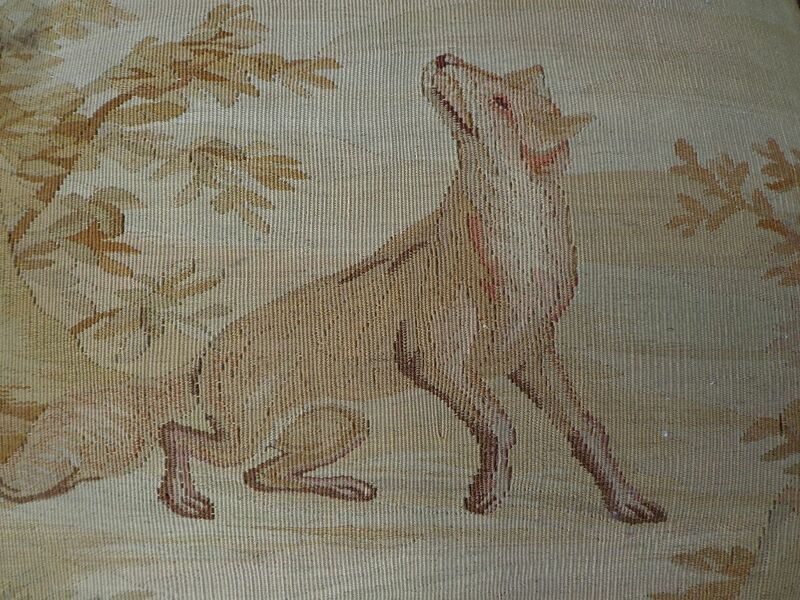 Truly a rare suite to find.